2. We are professionals in all we say and do. There’s NO swearing, smoking, drinking, or misconduct. Your goals are our goals, and we will work with you as you strive to cut water expenses, uphold pride in your property, and protect your assets. 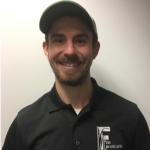 Jacob has served with Fisk Lawnscapes since 2015 working to cultivate premiere landscapes across Colorado Springs. Having experience in both landscape and maintenance, Jacob is knowledgable and detail-oriented on numerous landscaping issues. He works hard to create and maintain beauty on your property and is happy to answer any questions you may have. He understands that solid and consistent communication works hand in hand for great customer relations and strives to build genuine relationships. Jacob and his beautiful wife, Laura, live in Colorado Springs and enjoy exploring all the beauty that Colorado offers.